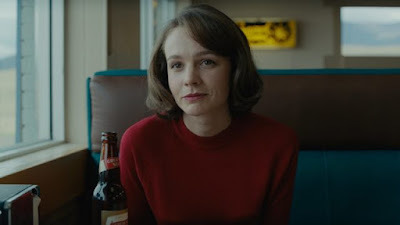 Paul Dano's adaption of the Richard Ford novel is a good little film. It is a solid literary adaption that will hold your interest even if it will eventually fade from your memory. In 1960 a family moves to Montana in search of a new start. When dad Jake Gyllenhaal loses his job his wife and son step up to keep money coming in. Things become complicated when Dad takes a job fighting the wild fire that are devouring the forests nearby. His wife, Cary Mulligan, soon realizes that she may not want to be there any more. As their teen age son tries to navigate a new school he is forced to watch as his mother drifts away from the person he always knew. Driven by four sterling performances WILDLIFE is a solid little film. It is the cinematic equivalent to reading a really good novel. When the film is done you know you've seen something. Its very meaty and satisfying. I went into the film not really wanting to see it and came out delighted I had seen it. WILDLIFE is solid little drama and highly recommended.